Paolo Cirio’s Jurisdiction Shopping is an exhibition that focuses on the current schizophrenic post-postmodern relationships between state, corporations and citizens. The personification of corporations and their increasingly transnational nature has produced a new set of relationships that have excluded and exempted some people from participation in the shared onus (responsibility) towards the state. At the same time, these privileged few continue operating illegally within the state; living, abusing and corrupting through financial malpractices the very society within which they live. Jurisdiction Shopping offers the viewer the possibility of engaging with a series of artworks that are based on the artist’s experience of attempting to generalize practices of illegality, therefore, presenting the possibility of a world within which exist frameworks for a generalized tax evasion. This is a period in which social injustice, illegal market and financial behaviors, corporate malfeasance as well as multiple obscure and hidden charges have become a form of private taxation and vexation parallel to the public taxations and vexations of corrupt states. These are phenomena that are contributing to the creation of large under classes within Europe and North America. In this context, it is important to understand Cirio’s artistic vision as one that presents mass tax evasion as the new great social equalizer and democratic approach to illegality. This exhibition and its artworks poke fun directly at the failure of the state in recycling itself in a new corporate and economic identity, as well as the failure of the social body to understand that the new corporate mythology and its systems are, in Deleuzian terms, part of the same old apparatus of capture or extortion. Both the state and the social body have been captured and are being squeezed from the corporate global economics that were presented as the saving grace of a concept of society that had been declared dead in the 1980s and that no longer exists. 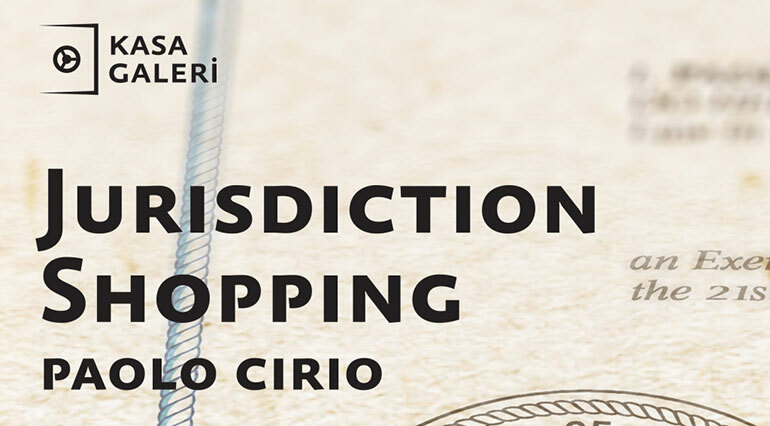 Kasa Gallery is proud to present its new exhibition Jurisdiction Shopping by Paolo Cirio, opening on June 14, 2013, based on the artist’s most recent Internet artwork Loophole for All. Jurisdiction Shopping and Decoding the Flow are two solo exhibitions by Paolo Cirio that were made possible by the partnership between Kasa Gallery and the Museum of Contemporary Cuts. Loophole for All aims to draw attention towards the relationship between today’s global economy and the alarming amount of tax-dodging activities by international corporations. The focal point of Loophole for All is international companies currently profiting from the legal secrecy provided by the Cayman Islands. Cirio’s activism is directed towards 200,000 companies, which he has identified by hacking into the government servers of the Cayman Islands. After stealing the list of all involved companies, Cirio has issued counterfeited “Certificates of Incorporation” from the Cayman Islands’ company registry. He has made them available for a short period of time on the website Loophole4All.com, in exchange for US Dollar 0.99. Following and battling with legal threats and after having being accused of making profits over illegal data, the artist now distributes these certificates for free. The installation at Kasa Gallery, the paper trail of this project, will be displayed with prints of the documents of this scheme. Loophole for All and other works of Paolo Cirio indicate a vital relation between activism and art. Other important works of Paolo Cirio include; Google will Eat Itself (2005), Amazon Noir (2006) and Face to Facebook (2011), all part of his Hacking Monopolism Trilogy. In these three works, the idea of revelation of the hegemony of online systems and the ‘loophole’ possibility generated as a result of the legal enforceability of such systems provide the viewer with an aesthetic perspective on the current interwoven relationships between art, society and issues related to political economy. Other Cirio’s artworks that touch upon the related topics include, P2P Gift Credit Card (2010) which challenges the inequalities present in the current financial circuit by presenting the viewers with a new visionary monetary policy. Cirio’s artist statement underlines that his works aspire to educate, inform, investigate, organize and influence contemporary society through the manipulation of media, information and communication. The artist creates aesthetic mythologies which play with and adopt themes and techniques used for the fabrication of realities in advertising strategies, political spin and entertainment, as well as in the economic and legal languages and their social applications. Award-winning artist born in 1979, Italy. Paolo Cirio has worked as a media artist in various fields: net-art, street-art, video-art, software-art and experimental fiction. He investigates perception and the creation of cultural, political and economic realities manipulated by modes of control over information's power. His work is built up on the interaction between media and performance.